As we were planning this trip my Mom suggested I call and see if I could get lucky and get us a reservation at Cinderella's Royal Table inside the castle for my birthday. You have to book that place 180 days in advance but I gave it a shot and actually got it booked! Well that opened up some other opportunities. 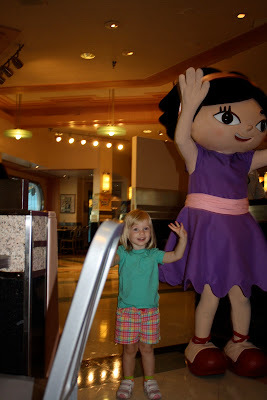 Knowing my mom was willing to pay the big bucks to do character dinning there was one that I really wanted to take Sarah to, Play and Dine at Hollywood and Vine. 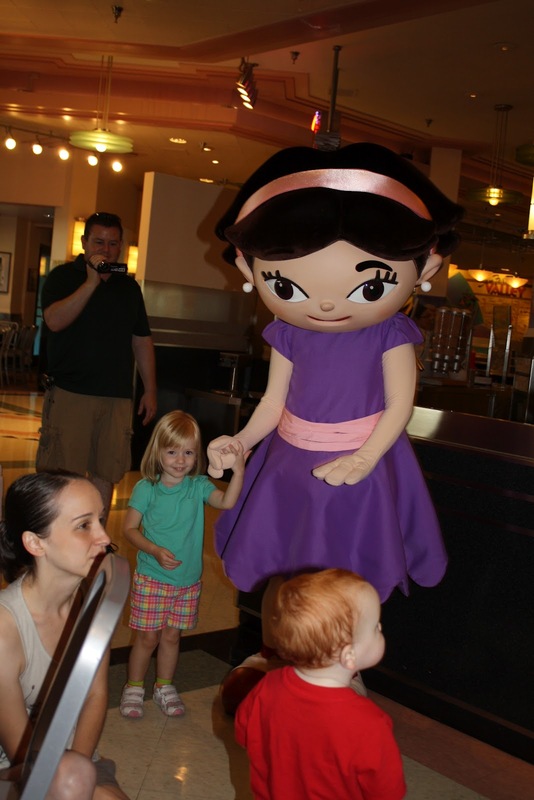 Play and Dine features popular characters from Disney Junior and it is the ONLY place that has a Little Einstein character. In fact, now unless it's a rare day when they've got someone out to do meet and greets you can't find a Little Einstein character in the park. So I was really excited when I was able to not only book Play and Dine on such short notice but I also got the exact time slot I wanted. As I was obsessively googling and trying to read other people's tips and ideas for Disney, I read somewhere to book the earliest table setting possible because you can get a clear shot of your family in the park before it gets crowded, but also they aren't usually as busy so you get more time with the characters. I'm so glad I found that tip! I don't know if that's true for the breakfast in Animal Kingdom or Magic Kingdom but Play and Dine is PERFECT for an 8:00 reservation. The characters came by the table at least 4 times. 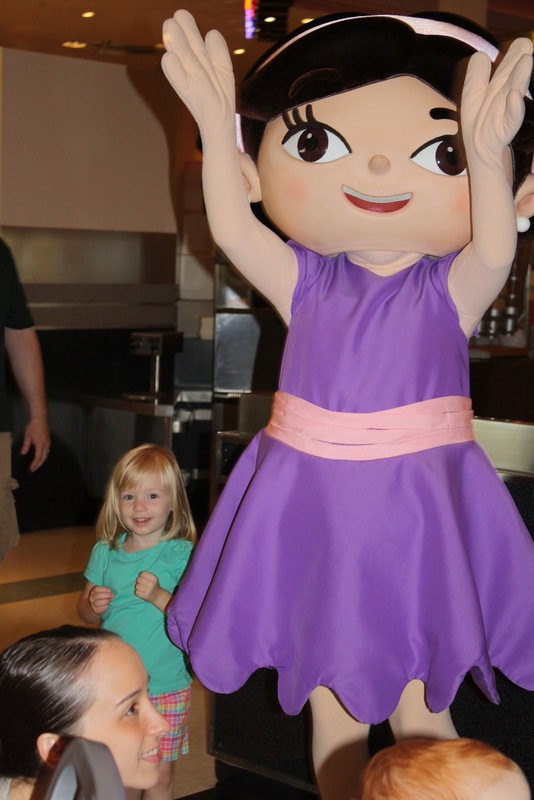 And while we were there for an hour they did 3 different songs where the kids were invited to come down and dance with the characters and singers. She pretty much owned June during the entire intro song and dance. I'm pretty sure that red headed kid might have tried to make a move on June and Sarah told him to move along. I think Aunt Sarah at one point hinted that I should move Sarah so that other kids could get a chance but there was no way I was doing that. Sarah was in love. 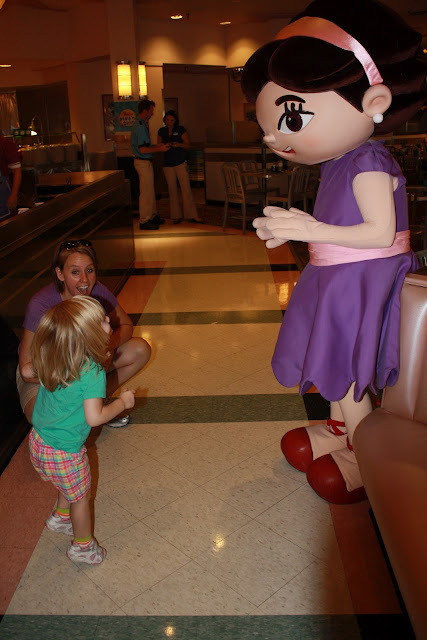 After they sang and dance to the Mickey Mouse Clubhouse's Hot Dog song I went through the lines and got Sarah some food. I was so distracted and excited that I totally didn't notice the GIANT buffet and only saw the small section that was lower to the ground so kids could serve themselves. But I got Sarah some Mickey Waffles and tater tots. Then I went back to get myself some food. The characters started circulating so I have Auntie Cam to thank for snapping pictures of the characters on the first go around. I'm also glad to see these pictures because I wasn't sure Sarah actually ate anything for breakfast. She was so distracted by everything going on and having such a great time. Every time June came around Sarah wanted to get down and hug her or dance with her. It was so cute. Leading up to this trip I told Sarah where we were going and would ask her who she'd want to see. Initially she would name Rapunzel or Ariel. One time she told me, "And I'm going to meet Prince Charming and give him a biiiiig hug and a biiiiig kiss." But then after I booked this breakfast and told her we were going to meet June that was the first thing she would mention to others about this trip. You could say, "Sarah where are we going in x days" and she'd tell you, "to meet June and I'm going to dance with her." This was so special. Jake came by the play with Sarah again. Sarah stole his nose. And put it on her nose. He was a good sport and played with her about it. He started touching his nose like it was missing and looking around for it. Sarah giggled. She thought she was a hoot. I didn't let her go up and dance during the second song and dance bit because she was actually eating a little bit. So the next time they called for the kids Sarah got to go play. 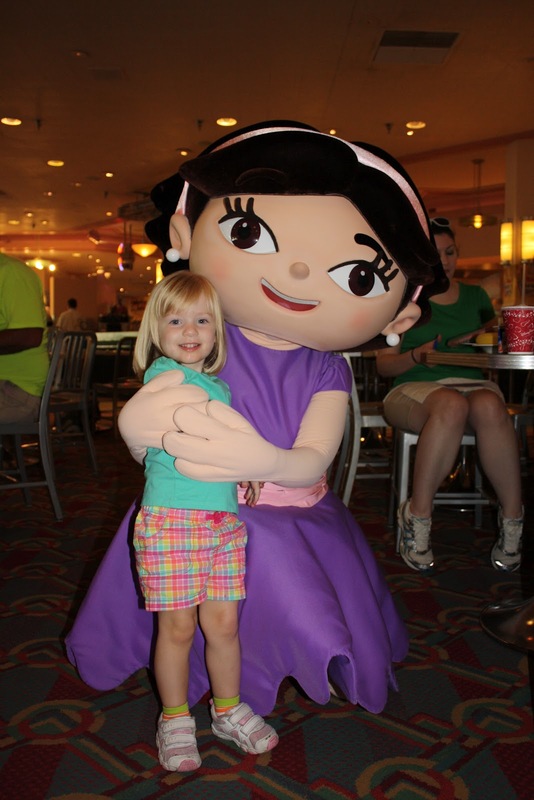 Here she is doing the conga line with Special Agent Oso. This breakfast was totally the highlight of her tiny two year old life. She'll never remember it so I'm glad we have these pictures but I'll never forget it. 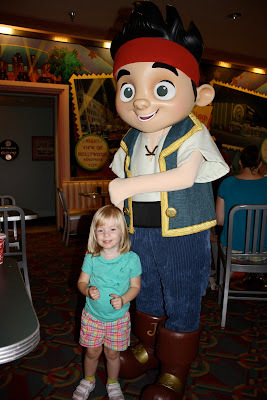 In all the times we went to Disney I don't ever remember us doing a character meal. 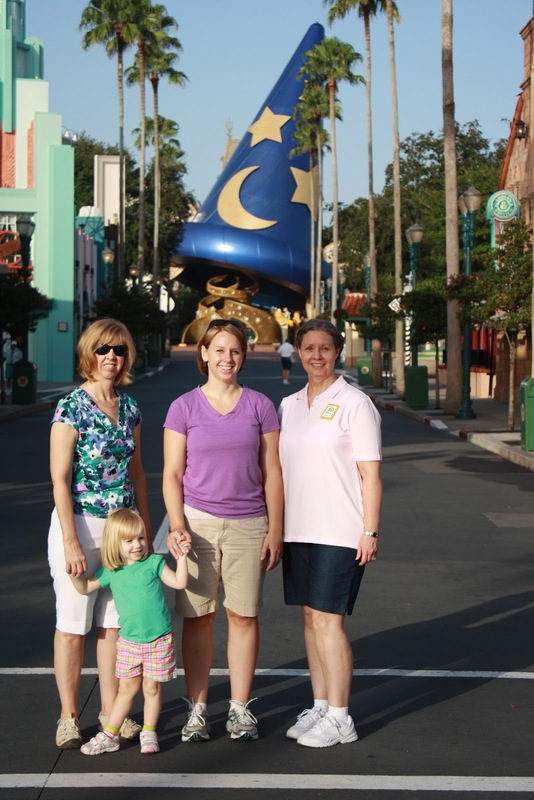 I remember us doing lots of nice dinners in the parks but chasing down characters wasn't our thing. So I'm glad my mom suggested doing a character meal. The food was amazing, but the joy on Sarah's face was exactly what I wanted for my birthday. And as a special treat. Here's a little video of Sarah dancing with June. 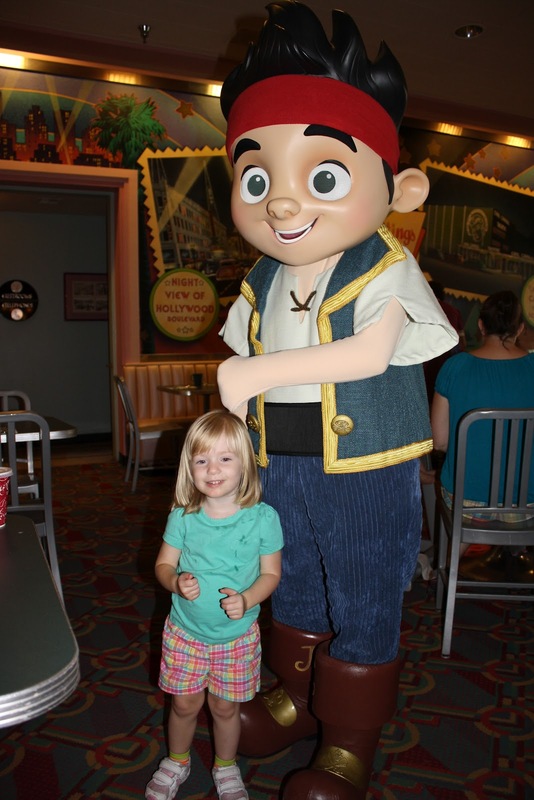 I guess I should explain since not everyone watches Disney Junior. 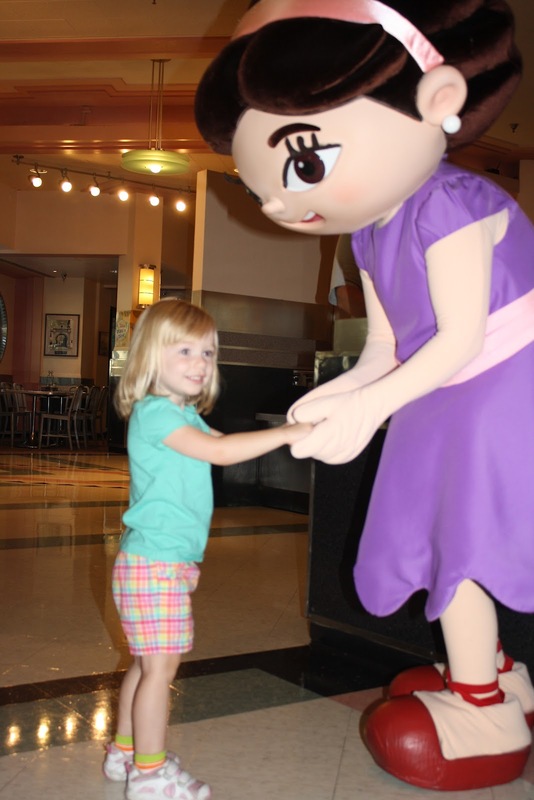 June is from Little Einsteins or as Sarah calls it "Pat Pat show". There are 4 Little Einsteins and each one has a talent. Leo (the leader) is a musical conductor, Quincy plays instruments, Annie sings, and June dances. The show introduces kids to classic art and music. Anyway, at some point June became Sarah's favorite character. It was Quincy for a while. And one day she came up to Chris and said, "yook daddy, I arabesque" and then did it. And he was like what? And I just shrugged my shoulders. Then she busted out the other dance moves telling us by name what they were that you can hear me calling out for her in the video. She learned them off the show. I think it's adorable. She's also learned how to recognize a number of musical instruments both how they look and sound from Little Einsteins. We don't watch great gobs of tv; she gets about an hour in the morning so I at least like that these shows seem to be teaching her something.